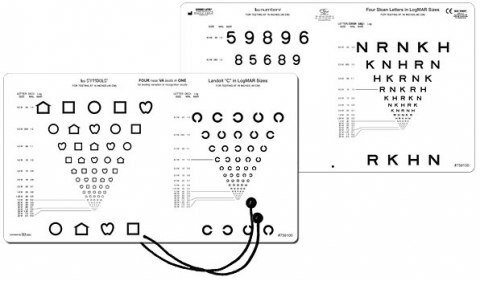 The Perception 4-1 Near Vision Chart combines 4 near vision charts into 1 easy to use test. One side contains both LEA Symbols and Landolt C while the other has LEA Numbers and Sloan Letters. Chart has 16" (40 cm) measuring cord ensuring proper testing distance. This chart only contains Letter Size, Decimal and LogMAR notations with range from 8.0M to .20M equivalent. 16" (40 cm) testing distance.